A few weeks ago, I posted Part I of this series, which focused on how I go about my business during the first session with a typical client. Since I’m trying to make a dent in my PhD thesis this year, I’m purposely trying to not get bogged down training clients all day long like I’ve been in the past. Therefore, many of my clients come from out of town, see me just once, and then have me help them with their current programming. In this article, I’m going to discuss how I go about helping clients set up their own programming. To recap, after the first session, I’ll have learned their optimal form for glute bridges and hip thrusts, I’ll have learned their best lateral band exercise, I’ll have reviewed proper form on squats, deadlifts, and back extensions, and I’ll have watched them train a multitude of movements with a variety of loads. Fully explaining this portion would require an entire book, but suffice to say, if I see glaring issues with a client, then I’m going to give them “homework” to do each day (better yet, several times each day). For example, I might prescribe daily goblet squats for the lifter who struggles with buttwink in a squat, I might prescribe daily band walking and/or ankle mobility drills for the lifter who struggles with knee valgus, I might prescribe various daily hip flexor stretches for the lifter who struggles with lumbar hyperextension, or I might just have clients hammer the 3 most basic lower body movements with just bodyweight for a few weeks until their form looks solid. Trainers should be prescribing simple drills for homework; you only see the client a few times per week, so if you can get them doing a drill three times per day they’re going to see much faster results. If I don’t see any issues with the client, then I skip this component and don’t prescribe any corrective work. This is what I heard too, and it prevented me from getting maximal results with my clients. I usually stress the fact that I have lots of great testimonials showing great glute development, whereas the bodybuilder in question usually has zero testimonials. If I ever saw a trainer with better before/after pics than me, I’d be all ears. But that never happens. I hope that doesn’t sound overly conceited, but the proof is in the pudding! Over the years, I’ve found that the glutes respond optimally to high frequency training. Seldom glute training is far inferior to frequent glute training. As a trainer, once I started having clients work their glutes during every training session, I started seeing way faster results. My confidence in this has been strengthened recently. I’ve been training a couple of clients only once per week for the past few months due to time constraints and the results are lackluster at best. If these individuals train with me three to four times per week they’d undoubtedly see way better results, just like my other clients. Therefore, I always encourage high frequency glute training with my clients. I like 3-6 days per week, but if doing 6 days/week you have to modify the volume, intensity, and exercise selection in order to avoid non-functional overreaching, injury, and stagnation. Six days per week can indeed work incredibly well, but you’d never want to do max deadlifts each session, for example. However, if you had a Hip Thruster and bands, you could do band hip thrusts and lateral band work 6 days per week, 52 weeks out of the year, and you’d see amazing results. That’s because these exercises highly activate the glutes without taxing the CNS or straining the joints/ligaments. Barbell hip thrusts, low volume single leg work, and posterior chain assistance lifts work are incredibly conducive to high frequency training. Each session, I have my clients perform lateral band work, and probably 80% of the time it’s going to be the lateral band exercise that they felt most during the testing in the first session (one client does band side lying clams each session, one does band seated abductions with a more upright posture, one does band seated abductions while leaning forward). I have clients do this at the end of the routine for the purposes of building up metabolic stress and forming a better mind/muscle connection. This frequent high metabolic stress helps build glute muscle! Most trainers erroneously omit this component to glute training, assuming that it’s not very effective for glute hypertrophy. The constant tension combined with high activation leads to a serious burn and pump, and this fuels the hypertrophic process. Each month, my clients are going to be thrusting, bridging, squatting, deadlifting, lunging, and hip-hinging, but they’ll do it a little bit different every four weeks. I vary bar positions, foot stances and widths, the type of resistance, loads and rep ranges, and exercise variations and utilize special techniques such as the constant tension method, rest-pause method, fast-reps, pause-reps, and isoholds with the hopes spurring continuous adaptations and results. 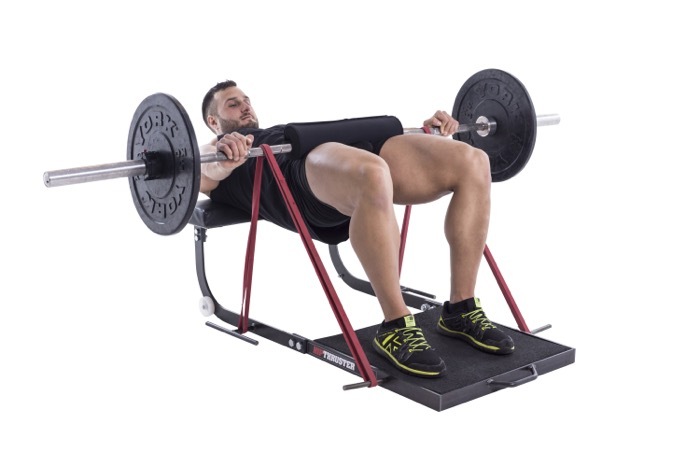 Speaking of isoholds, I always teach my clients to hold the top of their last rep of hip thrusts and band seated abductions for 5-10 seconds. This increases metabolic stress and builds good habits. The top position of the hip thrust is the hardest, and many individuals “skimp” and “short-change” their hip thrust ROM as the set progresses to failure. Therefore, pausing at the top and holding the last rep for time builds strength in the hardest position and reinforces good habits. A Get Glutes member emailed me a couple of months ago asking why I don’t utilize pyramid sets more often. Her rationale was that many lifters don’t get accustomed to heavier loads and realize their true strength potential with hip thrusts because they’re always staying in medium-to-higher rep ranges. This made a lot of sense to me. Don’t get me wrong, during my first session, I indeed have clients go heavy so they learn how strong they truly are at hip thrusts. But they need to continue along this path to keep strengthening all points on the rep-range continuum. I’ve been prescribing more pyramid sets to clients so they get the best of all worlds (greater tension with heavier loading, greater metabolic stress with higher reps). There are many ways to do a good pyramid, however, so this is just one example of a pyramid. Some other pyramid combinations include 10/8/6/15, 10/5/3/30, 10/8/6/8/10, and 20/10/5/20. Speaking of tension, lately some of the Get Glutes members have been discussing how when they go too heavy, they don’t feel it as much in their glutes during hip thrusts and bridges. Many have found a “sweet spot” that they feel maximizes glute tension and activation. For example, Kellie Davis and Marianne Kane feel their glutes working best when they stick with around 185-205 lbs. I encourage clients to figure out their sweet spot and stay include that load frequently in their training, though it’s still important to go lighter and also heavier for optimal results. Though this is the last part of the article, it’s a very important aspect of programming. I want people to love their programs. While I feel that full body routines are by far the most effective for glute building, there are indeed many individuals who prefer training with lower/upper splits or bodypart splits. If these people ask me for help and I can tell that they have a strong affinity for split training, rather than completely overhaul their programming, I’ll meet them in the middle. 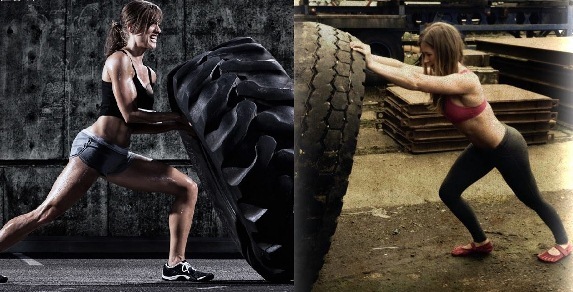 In fact, it’s quite easy to simply “trick” clients into doing full body training. For example, I’ll tell people who do a lower/upper split to just do high rep hip thrusts or back extensions on their upper body days, and possibly some lateral band work. For people who adhere to bodypart split training, I’ll split up their leg day into a quad emphasis day and a ham emphasis day while making sure to include glute exercises into both days, then I’ll have them add “glutes” into their arm or shoulder day while throwing in some hip thrusts and lateral band work. This way, they’re hitting glutes three times per week. There are often logistical aspects to work around, for example the client who can only make it to the gym twice per week. I might have them perform 2-3 sets of single leg hip thrusts and side lying clam raises twice per week to get in some extra glute work while also encouraging them to purchase some bands. Once my clients start seeing progress, they tend to be more open-minded to program overhauls, and I make “baby-steps” into getting their training exactly the way I want it to be. But the take-home point here is that the entire way through, the client loves their program and is confident in its efficacy. Hopefully this article has given you some important programming tips to ponder. While most aspects of my glute training regimens remain the same across the board, programming is always tailored slightly to the individual. I eluded to this in Strong Curves and I’ve been encouraging Get Glutes members to slightly modify their training according to their preferences and needs. In Part III of this article series, I’ll teach you some practical tips with individual exercises that will improve your performance. Happy Gluting my friends! Has anyone tried a bodyweight glute bridge with theraband around your knees? As I bridge up, I also abduct both lower extremities slightly. I fatigue quicker and feel more activation with this variation than I do with bridges alone. I like this variation Melanie, and it definitely leads to greater glute activation compared to using just bodyweight. However, I haven’t yet tested the effects with heavy loading. My guess is that you’d get higher glute activation with heavy bb hip thrusts compared to using both bands and a barbell, since the bands would limit the barbell weight, but this needs to be tested as I could be wrong. Also, it might lead to greater upper glute activity but not greater lower glute. I certainly hope so Sarah, I could use some of that karma right now haha! Thank you very much for the kind words. HiBret! Thank you for all your invaluable information, it’s been so useful! I have a question for you: I’ve read all your posts (at least twice) since I’ve discovered your website, but I’ve only seen one post where raised-heel squats were mentioned, and that was only in a warm-up routine. What are your thoughts on this? I been told by different trainers different things, it’s ok, it’s not ok, etc.. The only way can maintain “proper” back angle is if I take a very wide stance (which also gets critiqued). I just don’t know what to do at this point, and I am quite frustrated since I cannot progress to a higher weight load (at least one that feels challenging on my glutes). I’ve read that tibia to femur ratio can throw off the center of gravity…is this true? Any insite would be greatly appreciated!!! Whats nice about this site is nobody gets left out. Whatever you can do he has made it available so everyone can succeed…. Bret, how do you increase frequency for people who get really sore or get delayed soreness? It’s hard to work glutes 3 days a week when it feels like I’m sore for two days following a workout. Should I do less work more often, or just stick with 2 glute days/week if I think it’s going ok? Great question Kim. First of all, with Strong Curves and Get Glutes type programming, we make sure you don’t go overboard so this alone decreases soreness. Second, frequent training greatly reduces soreness. I remember when I used to train legs hard only once per week, I’d get absolutely crippled. When I moved to two days per week, the soreness diminished by approximately one half. When I started training lower body 3-5 times per week, the “bad” soreness vanished. I certainly still get sore, but not the “crippled” feeling and the sharp shooting pains from the past. Third, many of the exercises we use focus on metabolic stress and not muscle damage, therefore this controls soreness too. So just make sure you’re utilizing intelligent programming and you should be fine. Again, great question! I do have to agree with frequent training. I have done routines where I’ve trained squats for three days a week and the soreness is minimal. However, annihilating your legs once a week leaves you crippled for days! I rarely get sore from hip thrusts and glute bridges… I do them for lots of sets and I feel like my glutes are cramping at the time, but I don’t feel any soreness the next day! Is this normal? When I do front squats and reverse lunges, my glutes stay sore (burning!) for several days, even if I do low reps (5 on the front squats, 6 per side on the lunges) Does this happens to anybody else? Does it mean hip thrusts are not effective for me? Not at all Manny. Same happens for me with ht and bbgb…not much soreness (but barbell lunges cripple me). Means that lunges are creating more damage, whereas hip thrusts create more metabolic stress. Tension is king, metabolic stress is very important, and damage is a bit overrated IMO. how tall your buttocks circumference Bret? Thanks for another great article! Hopefully you could help with a question I have.Where should I purchase bands for banded clams, and what size? And I need a band to do banded pushups. Brett in your opinion what has a better transfer over to sports (i.e. lateral quickness)…lateral band walks or the seated band abductions? Tnx Bret! Keep up the good work! Great series Brett. I have one really basic question. When doing multiple sets for one exercise (like the pyramid progression shown) do you stick with that specific exercise until all sets are done and then move on to the next exercise? Or do you rotate across other exercises in your routine first and then come back around to do the second set, etc.? Stick with all sets until they’re done. Good question! I like that picture of the man doing the pushup. Did you have a hand in his marvelous gluteus maximus development? wonderful trove of information. thanks a lot for your work. quick question: if I train three days a week, does it have to be spread out, or can two days be back to back? y que pasa si no tengo pesas ¿ no hay ejercicios dificiles sin necesidad de pesas? y que opina de subir escaleras aumentara mis gluteos si los subo de manera rapida? Can you point me to any of you posts that specifically target the tops of the glutes? Or perhaps you can recommend some? I have more girth at the lower portion of my glute while the top part leaves much to be desired. Wow brilliant article and the greatest news ever! – I love training glutes and i’m like a kid at Christmas the night before training.. im so happy I can do this all day e’rryday! YAAAAAAAAAY. I have a question for you and need some help bad. With all the jumping squatting and all we do, can we train our glutes 5 days a week? we do bands, hip cicles, everyday but could we put in the hip thrust like on Wednesday on our non lifting day? My email is ksmith@anderson2.k12.sc.us. Thank you for any help you can give me. So, for barbell glute bridges, how many sets would you recommend per session? My max is 300 lbs at the moment. I HAVE SEEN SO MANY PPL SAYING THEY ONLY TRAIN GLUTES TWICE A WEEK AND I ALWAYS THOUGHT. HOW COULD THAT BE? THEIR GLUTES LOOK AMAZING, IM SURE THEY WORKOUT THEIR GLUTE 3-5 DAYS A WEEK, I DONT KNOW WHY PPL JUST CAN’T BE HONEST AND LOVE GIVING PPL FALSE INFORMATION. I WAS ABOUT TO START LISTENING INTO THAT HYPE UNTIL I READ THIS. THANK YOU FOR UR HONESTY! I generally like to train Monday to Wednesday as then I have the rest of the week/weekend to myself. Do you think I would see better results training Mon/Wed/Fri and allowing myself to have a rest day in between sessions for muscle recovery? Or training Mon-Wed is just as effective? I incorporate a mix of heavy loads/low reps and BW/ high reps into my training each day.